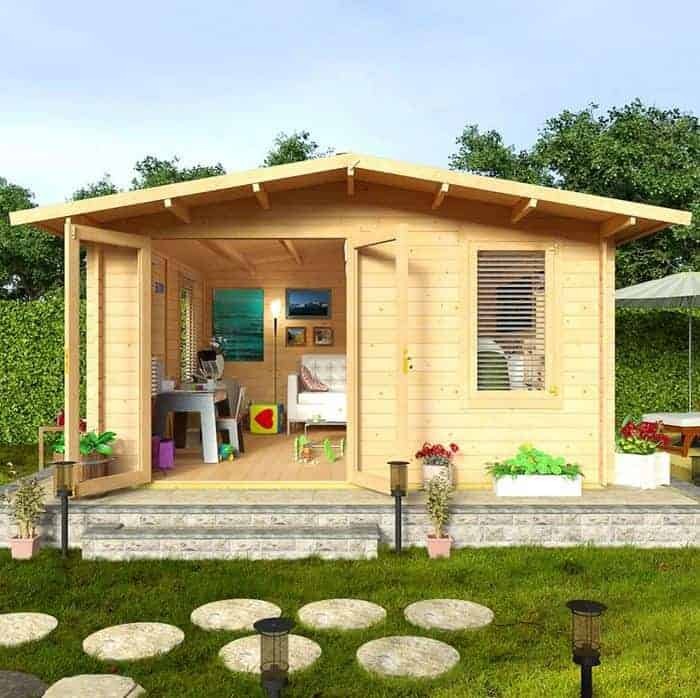 A log cabin that is part of a range, the Montana III has the most impressive depth, at 5m. This gives plenty of room inside the building for a wide range of uses. The cabin also has 28mm cladding as standard. This cladding is thick and very resilient against bad weather, and is a key feature of the building, adding to the stability and robust nature of the structure. The log cabin is supplied with single glazing in the windows. 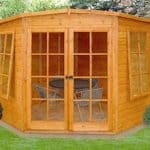 This is toughened plastic and provides a durable glazing throughout the summer. It is possible to purchase double glazing from BillyOh as an extra if you require some more resilient glazing all year round. There are no bearers supplied, and you have the choice between 11mm flooring or 19mm flooring. The roof is constructed using tongue and groove timber, and can be fitted with mineral felt or shingles covering. The company does offer a wide range of finishes for the building, including some bright and vibrant premium colors, and a varnish. As you will know from other reviews of Montana buildings on these pages, they are all the same width at 4 m. This is the deepest Montana, and BillyOh has given the building a very generous 5 m depth-wise. This is immediately noticeable in comparison to the other two in the range as soon as you step through the doors. If the 5 m is too much for you and you want something a little cosier, don’t forget you can go down in depth by a metre at a time, with the smallest model having 3 m in depth. But with the 5 m here, you also get two windows rather than the one window down the side that the 3 m depth model offers. We will cover the windows later in this review, but the big news here is the cladding. The Montana looks great, and if you were to ask anyone what a traditional US log cabin looks like you’d get something like this. And right at the heart of that rugged, frontier style look is the solid 28 mm cladding. 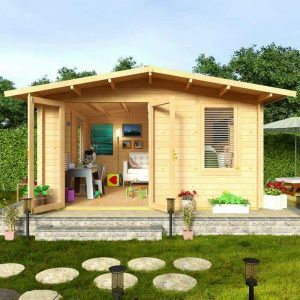 It is supplied as standard, and it makes for a very tough building. This stuff is thick enough to provide plenty of protection against the elements. Inside it’s reassuringly rigid, with none of that slight wobble that you might get with a shed. This is built for the long-term. We don’t get too excited here at WhatShed? 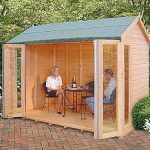 most of the time, but having a good 28mm on a log cabin for under £1.5 k is a bonus as far as we are concerned. This means that if you’re aiming to use this cabin throughout the year you will not have to worry about being cold. The 28 mm will do an excellent job of insulating the building. And let’s not forget those looks. As we approach the building for the first time, we liked the smooth appearance, and that solid, locked together look that tongue and groove has. A couple of warning bells came up here though. 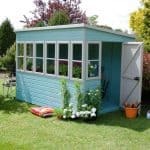 We started thinking about using this for a year round home office (it’s certainly deep enough) and then we noticed that BillyOh has supplied it with single glazing in the windows. This is the standard set up and you have to pay an extra £295 for double glazing. You may be thinking that single glazing is fine, but it isn’t glass. It’s good for UV protection however, which hints at its reason for being. Single glazing is plastic and is strictly there for seasonal use. 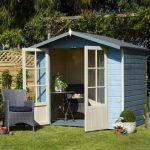 If you treat this like a summerhouse and you’re happy with that, that makes perfect sense. But just don’t expect it to bring any insulation at all in the winter. The double glazing option, while an extra cost, gives you that insulation, as well as noise reduction. We wouldn’t spend this much money on a building we use for three months of the year. 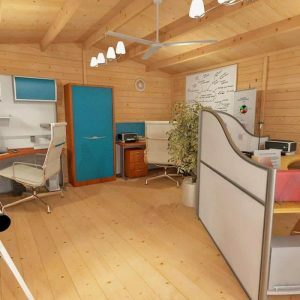 It’s a great space, and we would much rather use it in the winter as an office or even as a little retreat. So we’d opt for the double glazing for that reason. Bearers only underneath, with BillyOh allowing you to make choices. They’re good at this, and we have to respect them for the fact that they allow customers to essentially create their own building to a large extent. It’s not that evident here, but there’s some element of customisation. And having just bearers supplied as standard means you need to fit a floor. Unless you have your own plans, we recommend the 19 mm premium tongue and groove they offer over the 11 mm. The 11 mm will give you that summer seasonal protection and is perfect for occasional use over the year. But if you’re seeing this as a proper extension of your home, and that’s fair enough with that depth, then buy the 19 mm. It’s tough, and it’s a great complement to the walls. The roof is also tongue and groove, which gives it a nice bit of weight. While all roofs are waterproof (obviously) this is especially strong and rigid and as long as it has a nice cover, should give you an enhanced level of protection against the wet. There is no cover supplied so don’t forget that if you buy this item. Choose the mineral felt or the shingles to cover the roof. Mineral felt is easy to fit and does a good job of bringing extra rain protection. Shingles look great and come in a number of colours, and also provide enhanced UV protection for the roof and interior. The shingles are a good idea, and part of the reason you can buy them is because the roof is so strong. What would we do? Well, we are a big fan of BillyOh’s commitment to customisation, and would happily buy the shingles. It just makes for a tougher building,and if we were to build that dream home office we’d appreciate that strength up above. Always important, the finish is something you need to make a few choices on. What we appreciate here is that the choices are actually rather attractive, and BillyOh always make it clear that the building comes unfinished. You can do it all yourself if you wish or you can purchase the tins of finish from BillyOh (they say they always sell you the right amount for your building, but you may want an extra tin just in case). There’s a good choice here too, with a standard finish in four colours and a premium option in eight colours, or a special varnish. All of them, according to BillyOh, give great protection against mould and erosion. The tongue and groove work in the building really sets it up for success. This is real quality,and it means that you have a great foundation for the cabin. Again, if you use treatment regularly (once a year) you are looking at a very robust and resilient building that should last for years. Compared To the others in this range, this building is very spacious, with plenty of depth at 5m. There is a lot of room here. A little tricky to construct, and we recommend three people to get it just right. We are only giving this a ‘9’ because we think the single glazing compromises the building a little. Otherwise, it’s a good value for money building. Final Thoughts: This is a great range, so we are going to say nice things about this building. But on top of that it is the deepest one in the range so you get even more value here. The tongue and groove cladding means a resilient building that has a nice toughness to it. 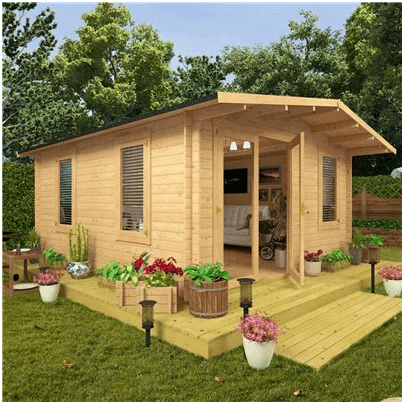 You also get a cabin that has a strong roof, and some great choices in the flooring. We liked the look of the cabin too. It feels like a rugged building should feel, and the solidity and the space inside make it a bargain. If we could ignore the single glazing we would, but it is the only thing that really lets it down. This reminded me of the cabin I stayed in, in the Carolina’s on holiday in the states. I had to have it. 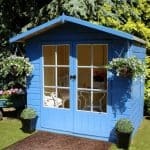 It’s the right size for a little summer escape or what we use it for which is a cabana style changing room for the pool. We hate a muddy or grainy house and that is what happens when you come in from the pool with all the wet gear on. So, this suits us down to the ground. 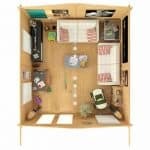 You need help to assemble, this is still a house “kit’ and needs someone with tongue and groove experience. What can I say, this was as easy as pie for my husband and two blokes! The tongue and groove design is strong and made me feel secure. I decorated it with some very pretty outdoor style furniture because I was concerned about weathering but you know, I was surprised and pleased that it wasn’t affected at all, even with English weather and damp, I could have put a carpet in there and had It be just fine. 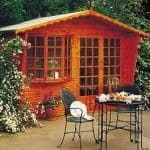 There is something to be said for a quaint little cabin in the garden. I quite liked the shape and size of it. Went well for two people. It is cozy and the assembly was not bad for what it was at all. Well chuff with the whole set up. Offsets the Coy pond though we don’t have a pool but the water features we have are a few and we love the way the cabin compliments it. The price for the construction and the safety factor is worth the price. Apart from the assembly part, because I’m not handy that way, I liked this. 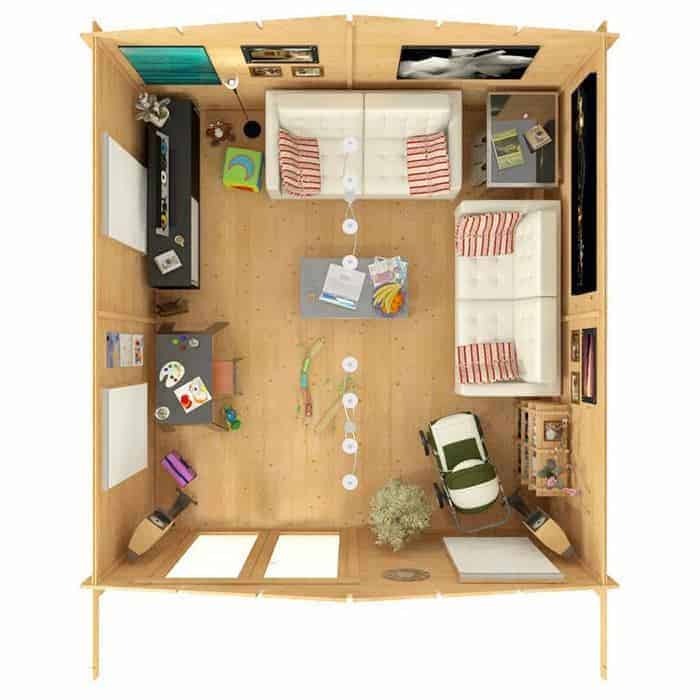 The layout suited the extra furniture I had in storage so I didn’t have to go out and buy more. I like the tongue and groove part because this means stability to me. This is where I will put my guests now that the family is growing larger and away from the main house they will be the majority of the time. This even has a place for a breakfast nook so you can serve meals in here without too much bother, again, putting less of a strain on the main home. It’s a great investment for our family. When we were looking for a summer house, we were looking for something that would let a lot of light in. This is a model that has the best windows for this. They are also quite strong. I went to inspect after a few strong storms and it withstood just fine and they clean very well. In fact, the whole structure cleaned up very well.